Product prices and availability are accurate as of 2019-04-16 15:27:05 BST and are subject to change. Any price and availability information displayed on http://www.amazon.co.uk/ at the time of purchase will apply to the purchase of this product. 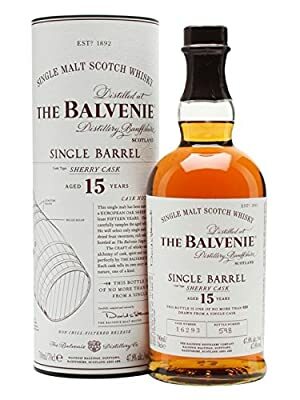 Balvenie haven't often released fully sherry matured whisky and we're very pleased to welcome the 15yo Single Barrel Sherry Cask to the range. Each bottle is part of a batch of only a few hundred, each filled from a single cask. Every batch will vary a little, but all will show off the great combination of Balvenie's spirit and rich sherry oak. 70cl Glass Bottle ABV: 47.8% Scotch Malt Whisky from the Speyside Region of Scotland Savour it neat, on ice, with a mixer or in a cocktail. It is an offence for any person under 18 years to buy or attempt to buy alcohol. Please drink responsibly.